"Sid the Kid" redirects here. For the hip hop producer, see Syd tha Kyd. Crosby was born in the Grace Maternity Hospital in Halifax, Nova Scotia, on August 7, 1987, to Troy and Trina (née Forbes) Crosby. Crosby's jersey number (87) and 2007 contract signing ($8.7 million per year) reflect his birthdate (8/7/87). Crosby grew up in nearby Cole Harbour, and has a younger sister, Taylor. His father was a goaltender who played for the Verdun Junior Canadiens in the Quebec Major Junior Hockey League (QMJHL). Troy played in the 1985 Memorial Cup and had been drafted 240th overall by the Montreal Canadiens in 1984, but never played at the NHL level. Growing up, Crosby admired Steve Yzerman and, like his father, was a Canadiens fan. Crosby began playing hockey by himself in his basement at the age of two, shooting pucks in a net that had the family dryer behind it, leading to a longstanding misconception that he was actually practising with the dryer; he learned to skate at age three. From age 12 to 15, Crosby attended Astral Drive Junior High School. He was a straight-A student and, according to the vice-principal, "an amazing role model, who was really kind to students in the learning centre and to special needs kids". At age 15, Crosby transferred to Shattuck-Saint Mary's in Faribault, Minnesota, to play with the school's hockey program. While playing for the Rimouski Océanic of the QMJHL, Crosby attended and graduated in 2005 from Harrison Trimble High School, in Moncton, New Brunswick. Early in his minor hockey years, Crosby began attracting media attention for his play and gave his first newspaper interview at age seven. When Crosby was 13, Nova Scotia's Minor Hockey Council refused to allow him to play midget, a level of minor hockey designated for 15- to 17-year-olds. His family sued but lost. The following year, he entered the midget level with the triple-A Dartmouth Subways and went on to score a combined 217 regular season and playoff points, leading Dartmouth to a second-place finish at the 2002 Air Canada Cup. He was named the MVP and Top Scorer awards at the national tournament at the tournament banquet held after the preliminary round and he finished the tournament with 24 points (11 goals and 13 assists) in 7 games. Crosby was called up as a 14-year-old to play two games with the Maritime Junior A Hockey League's Truro Bearcats that season. Crosby had been drafted by the Bearcats in the 2001 MJAHL Draft as a 13-year-old. During his midget season, Crosby appeared on the CBC's Hockey Day in Canada telecast. He has recalled numerous instances in which opposing players intentionally attempted to injure him, as well as constant verbal abuse from parents on and off the ice. Parents taunted and threatened Crosby so harshly, he took to not wearing his jersey between tournament games while he waited to play so that he would not be recognized. Due to this treatment, he elected to play for the American hockey program at Shattuck-Saint Mary's Boarding School, Minnesota for the 2002–03 hockey season. In 57 games with the Sabres, he recorded 72 goals and 162 points, leading the team to a U18 AAA national championship. Crosby was selected first overall in the 2003 Midget Draft by the Rimouski Océanic of the Quebec Major Junior Hockey League (QMJHL). In his first exhibition game, he scored eight points, leading his teammates to nickname him "Darryl" (in reference to Darryl Sittler's ten-point NHL game in 1976). In his first regular season game in the QMJHL, he scored one goal and added two assists. He was named QMJHL Player of the Week for two consecutive weeks at the start of the season and won the honour four more times as the season progressed. He was named QMJHL Player of the Month and Canadian Hockey League (CHL) Player of the Week three times each. Crosby finished his rookie QMJHL season with 54 goals and 81 assists over 59 games to capture the Jean Béliveau Trophy as the league's leading point-scorer. He was further recognized with the RDS/JVC Trophy (overall rookie of the year) and Michel Brière Memorial Trophy (most valuable player), becoming the first QMJHL player to win all three major awards at once. Rounding out Crosby's accolades for the 2003–04 regular season were QMJHL All-Rookie and First All-Star Team honours, as well as Offensive Rookie, Offensive Player and Personality of the Year Awards. As a team, the Océanic led the Eastern Division with 34 wins and 76 points. After receiving a first-round bye in the 2003 QMJHL playoffs, they defeated the Shawinigan Cataractes in the quarterfinals, then were eliminated by the Moncton Wildcats in the semi-finals. Crosby recorded 16 points (7 goals and 9 assists) over 9 playoff games. During the off-season, the World Hockey Association, a major professional league proposed to rival the NHL, held an Entry Draft on July 17, 2004. Holding the first overall selection, Toronto chose Crosby. The following month, it was reported that Crosby turned down a US$7.5 million contract over three years to play for Hamilton. Crosby told reporters that while "it took a lot to say no to that much money", he "work[ed] hard most of his life to play in the NHL". The contract would have paid him $2.5 million annually and an additional $2 million payout regardless of whether the WHA was realized as a legitimate league or not. However, it was not clarified, how Hamilton could have signed Crosby, as Toronto held his WHA playing rights. Nevertheless, the WHA never materialized. Returning to the Océanic for the 2004–05 season, Crosby continued dominating the league, leading the league with 66 goals, 102 assists and 168 points over 62 games to capture his second consecutive Beliveau Trophy. Joining Crosby on Rimouski's top line were wingers Dany Roussin and Marc-Antoine Pouliot, who finished second and third in league-scoring with 116 and 114 points respectively. In addition to his scoring title, Crosby was once again awarded Most Valuable Player, Offensive Player and Personality of the Year, while repeating as a QMJHL First All-Star. The Océanic finished with the regular season with the best record in the league, registering 45 wins and 98 points, including a league record-setting 28-game undefeated streak. They went on to capture the President's Cup as QMJHL playoff champions, defeating the Halifax Mooseheads in the finals. Crosby led the playoffs with 31 points (14 goals and 17 assists) over 13 games, earning him the Guy Lafleur Trophy as post-season MVP. With their QMJHL championship, the Océanic qualified for the 2005 Memorial Cup, Canada's national major junior tournament. Meeting the London Knights in the final, the Océanic were shut-out 4–0. Despite the loss, Crosby was named to the Tournament All-Star Team and captured the Ed Chynoweth Trophy as the competition's leading scorer with 11 points (6 goals and 5 assists) over 5 games. Knights forward Corey Perry was awarded the Stafford Smythe Memorial Trophy as the MVP. Soon after, he attended the NHL prospect combine in preparation for the 2005 NHL Entry Draft. Entering the 2005 NHL Entry Draft, Crosby was listed first overall in the NHL Central Scouting Bureau and International Scouting Services' respective rankings of prospects. [notes 1] He had also won the Mike Bossy Trophy as the QMJHL's best prospect. Crosby went on to be selected first overall in the draft by the Pittsburgh Penguins on July 30, 2005. Due to the labour lockout that suspended the entire 2004–05 NHL season, positioning for the 2005 draft was conducted via a weighted lottery based on each team's playoff appearances and draft lottery victories in the last four years. This lottery system led to the draft being popularly referred to as the "Sidney Crosby Lottery" or the "Sidney Crosby Sweepstakes". "Sid the Kid", a nickname given to him by the media early in his career, made his NHL debut on October 5, 2005, against the New Jersey Devils, and registered an assist on the team's first goal of the season, scored by Mark Recchi in a 5–1 loss. He scored his first NHL goal in the Penguins' home opener on October 8 against goaltender Hannu Toivonen of the Boston Bruins. Despite having registered two assists for a three-point night, the Penguins were defeated 7–6 in overtime. Crosby began his rookie season playing alongside Hall of Famer Mario Lemieux. Unfortunately, Lemieux was forced to retire due to an irregular heartbeat after having played just 26 games of the season. Near the midway point of the season, Penguins head coach Ed Olczyk was fired and replaced by Michel Therrien on December 15, 2005. The following day, Therrien designated Crosby as an alternate captain for the Penguins. The move drew criticism from some hockey pundits, including Don Cherry, who claimed that Crosby did not have the experience for the position. Cherry said, "An 18-year-old kid says he's going to give us ideas. What, from the Quebec League, he's going to give them ideas? Come on. That's ridiculous." Although hopes were high in Pittsburgh for the club to succeed, largely in part to the beginning of Crosby's NHL career and bolstered by the acquisitions of Sergei Gonchar, Žigmund Pálffy and Mark Recchi, the Penguins still finished with the worst record in the Eastern Conference. Nevertheless, Crosby's first NHL campaign was a personal success as he established franchise records in assists (63) and points (102) for a rookie, both of which had been previously held by Mario Lemieux. He also became the youngest player in NHL history to score 100 points in a single season, and only the seventh rookie ever to hit the benchmark. Overall, Crosby finished sixth in the NHL scoring race and seventh in the NHL in assists. Among Canadian NHL players, he trailed only Joe Thornton and Dany Heatley. Throughout the season, Crosby had battled with Washington Capitals forward and 2004 first-overall pick Alexander Ovechkin for the rookie scoring lead. He would finish second to Ovechkin's 106 points and also lose out to the Capitals forward for the Calder Memorial Trophy as NHL rookie of the year. It marked the start of a rivalry that would help "define the league" for over a decade. Throughout his first season, Crosby was accused by opposing players and coaches of taking dives and complaining to officials, which was typically attributed to his youth. He became the first rookie to earn 100 penalty minutes and 100 points in the same season, which magnified his reputation for complaining to NHL officials. Hockey analyst Kelly Hrudey compared Crosby to Wayne Gretzky, who had a similar reputation as a "whiner" in his youth, and suggested that as Crosby matured, he would mellow out and his reputation would fade. In his second NHL season, Crosby built on his rookie success. On October 28, 2006, Crosby scored his first NHL hat-trick in an 8–2 victory over the Philadelphia Flyers. His success against the Flyers continued as just over six weeks later, on December 13, he recorded the first six-point game of his career (one goal and five assists). The multi-point effort vaulted Crosby into the NHL scoring lead, which he would retain for the remainder of the season. He finished the 2006–07 with 36 goals and 84 assists in 79 games to become the first teenager to lead the NHL in scoring since Wayne Gretzky in 1980. Being only 19 years old at the time, he became the youngest player in NHL history to win the Art Ross Trophy and the youngest scoring champion in any major North American professional sport. "I just thought it wasn't right for me. As a team, we were playing great and you don't want to disrupt things like that. Individually, I was not ready to accept that responsibility quite yet. Going through the playoffs and having that experience has probably given me more confidence. I understand there is going to be a lot more responsibility on my shoulders with this, but it's something I'm ready for, I feel very comfortable with it and I'm just excited to get things going." At the NHL's annual awards show later in June 2007, Crosby completed a rare off-season "hat-trick", winning the Hart Memorial Trophy and the Lester B. Pearson Award in addition to his previously-clinched Art Ross Trophy. He became the youngest player in NHL history to win the Lester B. Pearson, and only the second youngest player ever to win the Hart (after Gretzky). He became the youngest player ever to be named to the NHL's First All-Star Team. Crosby and Evgeni Malkin (left) became the cornerstone players of the Pittsburgh Penguins in the mid-2000s, earning the nickname "The Two-Headed Monster". With Crosby's initial three-year, entry-level contract set to expire at the end of the following season, the Penguins signed him to a five-year, $43.5 million contract extension on July 10, 2007, ensuring his stay with the Penguins through the 2012–13 season. Midway through the subsequent season, Crosby recorded a Gordie Howe hat-trick on December 20, 2007, in a game against the Boston Bruins. His first assist came 55 seconds into the first period. At 8:26 of the same period, Crosby scored to give the Penguins a 2–0 lead. Then, five minutes and nine seconds into the second frame, Crosby fought ex-Penguin defenceman Andrew Ference to complete the hat-trick. This was Crosby's first NHL fight. In NHL's first Winter Classic (with a record crowd of 71,217 fans in attendance), Crosby scored the shootout winner in heavy snowfall to defeat the Buffalo Sabres. However, two weeks later, on January 18, 2008, Crosby suffered a high ankle sprain crashing leg-first into the boards in a game against the Tampa Bay Lightning. As a result, he missed the 2008 All-Star Game, to which he was named a starter. After missing 21 games, he returned on March 4 against the Lightning and earned an assist. However, two games after his return, he felt his ankle was not up to shape and decided that he needed more time for it to heal. Crosby consequently sat out of the Penguins' next seven games and returned on March 27, 2008, to help the Penguins defeat the New York Islanders 3–1. Despite his injury-shortened campaign, Crosby still managed 72 points in just 53 games. Crosby's absence from the Penguins' line-up served as a stepping stone for teammate Evgeni Malkin, who, now in his second season, was developing into a superstar in his own right. Picking up the offensive slack, Malkin finished second in league scoring to Alexander Ovechkin and was also a Hart Memorial Trophy nominee as MVP honours also went to Ovechkin. In addition to Crosby's return to the line-up late in the regular season, the Penguins acquired star winger Marián Hossa from the Atlanta Thrashers at the trade deadline, placing the club in a strong position to make a deep playoff run. Pittsburgh finished the regular season as Atlantic Division champions and just two points shy of the first-seeded Montreal Canadiens. In a rematch of the previous year's opening round, the Penguins began the 2008 playoffs facing the Ottawa Senators, whom they quickly swept in four games. After then defeating the New York Rangers and archrival Philadelphia Flyers, each in five games, the Penguins reached the final round for the first time since 1992, to face the Detroit Red Wings. After being shut-out as a team for the first two games of the series, Crosby scored the first two goals of game three as the series shifted to Pittsburgh to fuel a 3–2 win. The Penguins lost the next game and despite staving off defeat in game five, they were overcome by the Red Wings in six games. Crosby finished the playoffs with 27 points (6 goals and 21 assists in 20 games), tying Conn Smythe-winner Henrik Zetterberg (13 goals and 14 assists in 22 games) for the playoff scoring lead. Early in the following season, on October 18, 2008, Crosby scored one goal and three assists to surpass benchmarks of 100 goals, 200 assists, and 300 points for his career. On the play in which Crosby scored, teammate Evgeni Malkin assisted to record his own 200th point. As a result, Crosby had a team trainer cut the puck in half so both players could commemorate the achievement. Minor injury troubles kept Crosby from five games early in the season as he was listed day-to-day, but he was, for the most part, able to bounce back from the previous injury-riddled season and stay healthy. He recorded 33 goals and 70 assists to finish third in league scoring, as Evgeni Malkin captured his first career Art Ross Trophy. Entering the 2009 playoffs as the defending Prince of Wales Trophy winners, the Penguins defeated the Philadelphia Flyers in the opening round before meeting the Washington Capitals for a highly publicized second-round matchup. The series was heavily followed as it pitted Ovechkin of the Capitals against both Crosby and Malkin, who together finished as the league's top three scorers that season. In the second game, Crosby and Ovechkin recorded matching three-goal efforts for their first career playoff hat tricks in a 4–3 Capitals victory. Despite being down 2–0 in the series, Crosby and the Penguins won the next three games and eventually defeated the Capitals in a seventh and deciding game, in which Crosby added another two goals. Following a sweep of the Carolina Hurricanes in the Eastern Conference Final, Crosby opted against recent NHL tradition and picked up the Prince of Wales Trophy, which he had left untouched the previous year. In explanation of the change of heart, Crosby said, "We didn't touch the trophy last year, and obviously we didn't have the result we wanted ... Although we haven't accomplished exactly what we want ... we can still enjoy it." Crosby with Marc-André Fleury (left) and the Stanley Cup during the Penguins victory parade. By winning the Stanley Cup in 2009, Crosby became the youngest NHL captain to have his name engraved on the Stanley Cup. The Penguins met the Detroit Red Wings for the second straight year in the Finals, and this time Crosby won his first Stanley Cup title in seven games. At 21 years, 10 months, and 5 days, Crosby became the youngest NHL captain to win the Stanley Cup since 1895. (The youngest captain to lead his team to the Stanley Cup in the history of the trophy is Mike Grant of the 1895 Montreal Victorias, who was 21 years and 2 months at the time.) In the deciding Game 7, Crosby was forced to watch all but 32 seconds of the third period from the bench after suffering a knee injury less than halfway through the second period due to a hit from Johan Franzén. Following the game, Crosby was criticized by Detroit forward Kris Draper for neglecting to shake hands with some of Detroit's players, most notably captain Nicklas Lidström. An irate Draper was quoted as saying, "Nick was waiting and waiting, and Crosby didn't come over to shake his hand. That's ridiculous, especially as their captain." Crosby replied afterward, saying, "I just won the Stanley Cup. I think I have the right to celebrate with my teammates. I know it's not easy waiting around... I understand if they don't feel like waiting around. But you know what? It's the easiest thing to do in the world, to shake hands after you win. I had no intentions of trying to skip guys and not shake their hands. I think that was a pretty unreasonable comment." In the 2009–10 NHL season, Crosby tied Tampa Bay Lightning centre Steven Stamkos for the lead in goals scored, with 51 goals, earning the Rocket Richard Trophy. He also garnered 58 assists for a total of 109 points, enough to tie with Alexander Ovechkin for second in league points, trailing only the Vancouver Canucks' Henrik Sedin's 112. Crosby was also named a finalist for the Hart Memorial Trophy and Ted Lindsay Award. Crosby won the Mark Messier Leadership Award, getting recognized as a "superior leader within the sport, setting a positive example through on-ice performance, motivation of team members and a dedication to the community". This was the second time he had received this honour, the other being in January 2007, during the award's first year when it was presented monthly. Crosby's Penguins were defeated in the second round of the 2010 Stanley Cup playoffs, losing to the Montreal Canadiens in seven games. Crosby had 19 points in 13 games in the playoffs, though through seven games against the Canadiens, he had only one goal and four assists. Game 7 was also the last game to be played at Mellon Arena, the Penguins' home rink since the start of the franchise. On July 27, 2010, Crosby joined his mentor Mario Lemieux to be the first to skate on the new ice at the Consol Energy Center. The two skated for about five minutes before being joined on the ice by a group of young hockey fans all wearing Lemieux's 66 or Crosby's 87 jerseys. "When you get a typical injury you're given a time frame, you're gradually working towards getting back ... With concussions there is not generally a time frame or a span where you're feeling better. You feel like you're getting better and it can be one day and you're back to where you started. It's a frustrating injury and one that anyone has gone through can relate. It's a hard one to understand unless you've gone through it". — Crosby on his concussions. In the 2010–11 season, Crosby had a 25-game point streak, which began November 5, 2010, against the Anaheim Ducks and ended December 28, 2010, against the New York Islanders. During this streak, he had 27 goals (including three hat-tricks) and 24 assists for 51 points. This streak was tied for 11th-longest point streak in NHL history, and he was named First Star of the Month in both November and December. On January 3, 2011, Crosby was selected as a 2011 All-Star, along with teammates Evgeni Malkin, Marc-André Fleury and Kris Letang. However, neither Crosby nor Malkin were available to play in the All-Star Game due to injuries, and rookie Jeff Skinner (along with Paul Stastny) were named as replacements. In consecutive games – the 2011 NHL Winter Classic on January 1, 2011, against the Washington Capitals and then January 5 against the Tampa Bay Lightning – Crosby suffered hits to his head from Dave Steckel and Victor Hedman respectively. After experiencing several concussion symptoms, Crosby did not return for the rest of the regular season, and he missed the 2011 playoffs. The Penguins were further crippled when Evgeni Malkin suffered a torn ACL and MCL, taking him out for the rest of the season and leaving the Penguins without their two highest-scoring players. Despite Crosby's injury and subsequent absence for the final 41 games of the season, he finished as the Penguins' leading scorer. His 66 points in 41 games were 16 points ahead of the second-highest team scorer, defenceman Kris Letang. In so doing, Crosby set an NHL record for fewest games played by an NHL team's points leader. Crosby was sidelined for most of the 2011–12 season after being diagnosed with concussion-like symptoms. Crosby missed the first 20 games of the 2011–12 season due to the lingering effects of his concussion. He returned on November 21, 2011, in a game against the New York Islanders, scoring two goals and two assists in a 5–0 shutout for the Penguins. However, after playing another seven games – scoring a total of 12 points in 8 games – Crosby's concussion-like symptoms returned in December 2011, possibly following an elbow hit by David Krejčí in his eighth game of the season. Despite passing a successful ImPACT test, Crosby decided not to return on the ice until he felt perfectly fine, stating that he also must "listen to [his] body". Crosby returned to action on March 15, 2012, scoring an assist in a 5–2 win against the New York Rangers. Despite only playing 22 games, Crosby recorded 29 assists to go with 8 goals for 37 points, including his 600th career point. He later credited neurologists at UPMC and chiropractic neurologist Ted Carrick with helping him return to hockey. Crosby's return in advance of the playoffs resulted in many experts predicting that the Penguins would win their second Stanley Cup title in four years, and though the Penguins were accordingly picked to oust the Philadelphia Flyers in their first round series, it was acknowledged that it would be a tough series for both teams. The Flyers shocked the Penguins by winning the first three consecutive games, the third of which saw the teams combine for 158 penalty minutes. After the 8–4 loss in Game 3, Crosby was widely criticized for his conduct during the game, and for his testy post-game interview. When asked about an incident where Flyer forward Jakub Voráček had dropped his glove and Crosby swatted it away with his stick before Voráček could pick it up, Crosby replied, saying, "I don't like any guy on their team there, so his glove was near me, went to pick it up, and I pushed it, so yeah, that's... [...] I don't like them. Because I don't like them. I don't like... I don't like any guy on their team." When the interviewer suggested that he could have skated away, Crosby replied, "Skate away? Yeah, well, I didn't that time." The Penguins went on to win the next two games, but ultimately lost the series in Game 6. Crosby would finish with three goals and five assists in the six games. On June 28, 2012, the Penguins announced that Crosby had agreed to a 12-year, $104.4 million contract extension set to keep Crosby in Pittsburgh through to the end of the 2024–25 NHL season. The start of the 2012–13 was postponed until January 2013 due to the owners locking out the players as negotiations took place to solidify a new collective agreement for the players. During this time, Crosby was a regular attendee of meetings taking place between National Hockey League Players' Association (NHLPA) representatives and NHL owners. The lock-out began on September 15, 2012, and ended January 6, 2013, with the NHL regular season beginning on January 19. During the 119-day lock-out, Crosby was often questioned about his future plans should the lockout persist, and said on more than one occasion that he was entertaining contract offers from various teams in European leagues (where many NHL players went so that they could continue playing in a professional capacity while waiting for the lock-out to end or for the NHL season to be officially cancelled). Crosby continued to practice and participated with other NHL players who had not gone overseas in several exhibition games open to the public. Crosby during the 2012–13 NHL season. With the season finally underway in late-January, Crosby set the pace for scoring, totalling 31 points (9 goals and 22 assists) through the first 21 games. He remained hot through March, scoring another 25 points (6 goals and 19 assists) in 15 games as the Penguins went unbeaten over this stretch. However, his regular season came to an abrupt end on March 30 in a home game against the New York Islanders. Crosby's teammate Brooks Orpik unleashed a slapshot which caught Crosby in the mouth, causing the centreman to lose several teeth. Crosby was down on the ice for several minutes before the medical staff was able to help him to the dressing room with Crosby holding a towel over his face. Initially the prognosis was not severe, but it was discovered a short while later that Crosby had broken his jaw and would require several rounds of reconstructive dental surgery. He missed the final 12 games of the regular season and finished fourth in the scoring race, losing the title to Tampa Bay's Martin St. Louis by four points. Crosby shakes hands with Bruins captain Zdeno Chára following Pittsburgh's elimination from the 2013 playoffs. Crosby returned to the ice May 5 for the Penguins' second game against their first-round playoff opponents, the New York Islanders, ironically, the team Pittsburgh had been playing when Crosby was injured. Despite two goals from Crosby, Pittsburgh lost the game 3–2, tying the series at one game a piece. The Penguins would ultimately prevail 4–2 in the series over the Isles with Crosby scoring nine points (three goals and six assists) in the five games in which he played. Crosby and the Penguins moved on to face the Ottawa Senators in the second round, with Crosby scoring a hat-trick in Game 2 of the series. Pittsburgh quickly defeated Ottawa four games to one in the series with a still-hot Crosby finishing the series with four goals and two assists. The Eastern Conference Finals came down to what many felt were the two best teams in the conference: Pittsburgh and Boston. Bruins goaltender Tuukka Rask put on an outstanding performance, shutting-down Pittsburgh's potent offence with the help of a stifling defensive effort from his teammates. The Penguins were held to just two goals in the series, with Rask stopping 134 of 136 shots on goal (.985%). Crosby, who had been strong for the Penguins in the regular season and through the first two rounds of the playoffs was held off the score sheet entirely, finishing the series with no goals and no assists on 13 shots. The Bruins swept the Penguins in four-straight games, ending Crosby's bid for a second Stanley Cup championship. In the off-season, Crosby was awarded his second Ted Lindsay Award and finished as runner-up to the Hart Memorial Trophy and Bill Masterton Memorial Trophy. Crosby put together a healthy and productive campaign in 2013–14, playing 80 games for the first time since the 2009–10 season. Crosby finished the season with 36 goals and a league-leading 68 assists, marking the first time in his career that he led the league in assists. He also finished with a league-high 104 points, winning the Art Ross Trophy for the second time in his career. He also went on to win the Hart Memorial Trophy and the Ted Lindsay Award. Finishing first overall in the Metropolitan Division, the Penguins were matched-up with a new division rival, the Columbus Blue Jackets, in the first round of the 2014 playoffs. Despite a very back-and-forth series and not a single goal by Crosby, the Penguins defeated the Jackets in six games to advance to a second-round matchup with the New York Rangers. Going into their second-round series with the Rangers, Crosby looked to end a long playoff goal drought, which dated back to the 2013 Conference Finals against the Boston Bruins. After dropping Game 1 at home, Crosby broke his goal drought in Game 2 as the Pens tied the series at 1–1 heading back to Madison Square Garden. The Penguins would capitalize on their Game 2 win, taking next two games and eliminating the Rangers home ice advantage. However, the Rangers would quickly rebound, winning Game 5, 6 and 7, sending the Penguins home without a prize for the fifth straight season. The team's collapse prompted Penguins ownership to fire general manager Ray Shero, replacing him with Jim Rutherford, the former general manager of the Carolina Hurricanes. Rutherford's first action as GM was to fire Dan Bylsma as head coach, and on June 25, he announced that Mike Johnston was hired as new head coach. Crosby finished the 2014–15 season with the highest point-per-game average and a total of 84 points, trailing only John Tavares (86 points) and Art Ross winner Jamie Benn (87 points). On November 26, 2014, Crosby scored his 800th career point, becoming the sixth-fastest player in NHL history to reach that milestone. On January 4, 2015, in a game against Philadelphia, Crosby scored his 300th career NHL goal. Despite a strong start to the season, the injury-plagued Penguins entered the playoffs as the Eastern Conference's second wild card. Facing the New York Rangers, Crosby helped even the series with two goals in Game 2. Despite this, the Penguins were defeated in five games and was eliminated in the first round for the first time since the 2012 playoffs. Starting the 2015–16 season, the Penguins had gone through a major overhaul of their roster, adding a number of offensive players such as right winger Phil Kessel. Despite a line-up laced with some of the world's finest offensive talents, Crosby struggled to score points, as he and the team had for much of the Johnston era. By the time Johnston was fired on December 12, 2015, after posting a 15–10–3 record through 28 games, some media outlets began speculating that Crosby had aged out of his prime scoring years. On December 16, The Washington Post wrote, "Sidney Crosby has widely been regarded as the NHL's best player since he burst on the scene as a rookie in 2005 ... But Crosby just hasn't been himself this season, scoring just six goals in 29 games and sitting with a plus/minus of minus-seven. All players go through slumps, but it is clear that the Crosby we knew has been on the decline for some time." His slow start was capped off by not being selected as a starter for the 2016 NHL All-Star Game. However, under new head coach Mike Sullivan, the 28-year-old turned his season around, outscoring all NHL players from December 12 through the end of the season. On February 2, Crosby scored three-straight goals for his first natural hat-trick in more than five years. Four days later, Crosby scored his 900th, 901st and 902nd career NHL points to fuel a 3–2 overtime comeback victory over the Florida Panthers. He tallied at least 1 point in 15 of Pittsburgh's 16 games in March, including six multi-point efforts, and was subsequently named the NHL's First Star of the Month. On April 2, Crosby recorded his 600th NHL assist as the Penguins clinched their berth in the 2016 playoffs. Six days later, he scored in overtime against Washington Capitals to secure home-ice advantage in the first round of the playoffs. Crosby finished the season with 36 goals and 85 points in 80 games, including a career-high nine game-winning goals, and was voted team MVP for the sixth time in his career. His two-way game also received league-wide praise, with Hockey Hall of Fame coach Scotty Bowman stating that Crosby would be a good candidate for the Frank J. Selke Trophy as the league's best defensive forward. Crosby's comeback also impressed Wayne Gretzky, who said, "He had a tough start, but the sign of an elite athlete is a guy that battles through it. He didn't point any fingers, he just battled through it, and I don't think there is any question the last 40 or so games, he made a case for the MVP. He was that good. He went to another level." On May 7, Crosby was named a finalist for the Hart Memorial Trophy. He finished as the first runner-up with 800 points and 11 first-place votes. After losing to New York in the past two playoffs, the Penguins eliminated the Rangers in the first round, winning four games to one, after losing to the Rangers by the same series margin in the first round the previous year. Crosby led the team in scoring with three goals and eight points. The Penguins then eliminated the Presidents' Trophy-winning Washington Capitals in six games, without much offensive production from either Crosby (two assists) or Malkin (one goal and one assist). Advancing to their first Conference Final since 2013, Crosby scored the overtime winner against the Tampa Bay Lightning in Game 2. The goal was scored 40 seconds into overtime for a 3–2 win, the fastest overtime goal in Penguins' playoff history, and the first of his career in the playoffs. In the following game, he scored the game-winning goal in a 4–2 victory. After dropping the next two games, Crosby scored his third game-winning goal of the series in Game 6, forcing a final game in Pittsburgh. Defeating the Tampa Bay Lightning 2–1 in Game 7, Crosby helped his team win the Eastern Conference championship, advancing to the Stanley Cup Final against the San Jose Sharks. In the series, the Penguins defeated the Sharks in six games to earn Crosby his second Stanley Cup title. He became the ninth player to win the Stanley Cup twice as well as two Olympic gold medals. Finishing the playoffs with 19 points (6 goals and 13 assists), including the primary helper on the Cup-winning goal scored by Kris Letang, Crosby was awarded the Conn Smythe Trophy as the MVP of the playoffs. Crosby missed the first six games of the 2016–17 season after being diagnosed with a concussion just a few days before the season opener against the Washington Capitals. Upon his return, he scored 30 goals in his first 45 games, and on February 16, 2017, he registered an assist on a Chris Kunitz goal against the Winnipeg Jets to reach 1,000 NHL points, doing so in just his 757th game to become the 12th-fastest (and 11th-youngest) player to reach that milestone. He also participated in his first NHL All-Star Game since 2007, winning the shooting accuracy segment of the Skills Competition. He was named team MVP and finished the season as the runner up for the Art Ross Trophy with 44 goals and 89 points in 75 games. It marked the eighth time he finished a season in the top-three in NHL scoring, tying Mario Lemieux, Stan Mikita and Phil Esposito for the third-most instances in history behind only Wayne Gretzky (15 times) and Gordie Howe (12 times). With his 44 goals, Crosby captured the Rocket Richard Trophy for the second time in his career. Crosby was also named a finalist for the Hart Memorial Trophy and Ted Lindsay Award. Crosby won his second straight Conn Smythe Trophy in 2017. Entering the 2017 playoffs as the defending Stanley Cup champions, the Penguins defeated the Columbus Blue Jackets in five games before meeting the Washington Capitals in the second round. After winning the first two games on the road, Crosby sustained a concussion after suffering an injury from a slash and cross-check from Alexander Ovechkin and Matt Niskanen in Game 3. He missed Game 4 but returned to practice the next day and played in Game 5. The Penguins would eventually eliminate the Capitals in Game 7, with Crosby assisting on the series-winning goal. The Penguins then defeated the Ottawa Senators in a gruelling seven-game series to secure their second consecutive trip to the Stanley Cup Final. Crosby had the primary assist on the series-clinching goal, scored by Chris Kunitz in double overtime. Facing the Nashville Predators in the Finals, Pittsburgh jumped out to a two-game lead, despite being outplayed for long stretches in both games. The Predators responded by tying up the series, winning Game 3 and 4 at home. In Game 5, the Penguins' captain delivered a dominant performance, adding three assists in a 6–0 win to pass Lemieux for most Stanley Cup Final points (20) in franchise history. After defeating the Predators 2–0 in Game 6, the Penguins became the first team to repeat as Stanley Cup champions since the 1997–98 Detroit Red Wings, and the first to do so in the salary cap era. Crosby won his second consecutive Conn Smythe Trophy as the most valuable player of the playoffs, only the third player to do so, after Bernie Parent (1974, 1975) and Mario Lemieux (1991, 1992). He finished second in scoring behind Evgeni Malkin with 27 points (8 goals and 19 assists) in 24 games. In the 2017–18 season, Crosby appeared in all 82 of Pittsburgh's regular season games for the first time in his career, finishing with 29 goals and 60 assists for 89 points. On February 12, 2018, he scored his 400th NHL goal, becoming the 95th player to reach the milestone. On March 21, he recorded his 700th career NHL assist. The Penguins began their 2018 playoff campaign against the Philadelphia Flyers. In Game 1 of the Battle of Pennsylvania, Crosby recorded a natural hat-trick in a 7–0 win. On April 18, in Game 4, Crosby passed Mario Lemieux as the Penguins' all-time playoff points leader with 173. The Penguins ultimately defeated the Flyers in six games, with Crosby scoring 6 goals and 13 points. After the series, retired Hockey Hall of Fame centre Bryan Trottier said of Crosby, "Sid has a wonderful gift to maintain his composure and not get rattled. You like the emotion he shows, too. I think he fires his team up, and that's why he's wearing the 'C' [for captain]." The Penguins were eventually eliminated in Game 6 of the second round by the eventual Stanley Cup champion Washington Capitals, ending Penguins's bid for a three-peat. Crosby finished with 21 points (9 goals and 12 assists) in 12 games, pushing his career playoff total to 185, tied with Steve Yzerman for tenth-most all-time. On January 3, 2019, Crosby was selected to play in the NHL All-Star Game for the eighth time in his career. He scored four goals and four assists, helping the Metropolitan Division to victory; his efforts won him his first All-Star MVP award, making him the sixth in NHL history to have won that award after having won the Conn Smythe Trophy and Hart Memorial Trophy. During the 2018–19 season, Crosby passed Mario Lemieux to become the Penguins' all-time leader in games played (916), and moved into second place on the Pens' all-time scoring list with his 440th career goal in a 5–1 victory over the Montreal Canadiens on March 3, 2019. Two days later, he became the 48th player in NHL history to score at least 1,200 career points. On April 5, the Penguins clinched a playoff berth for the 13th consecutive season under Crosby's captaincy. He finished the season with 100 points (35 goals and 65 assists), the first time he has reached the 100-point mark since scoring 104 points in 2013–14. Crosby debuted internationally for Canada at the 2003 U-18 Junior World Cup in the Czech Republic and Slovakia. He was the youngest player on the under-18 team, having turned 16 shortly before the beginning of the tournament. After seven consecutive gold medals at the tournament, Team Canada lost in the bronze medal game to the Czech Republic 8–2. He scored four goals and six points over five tournament games. Crosby went on to compete in two World Junior Championships with Team Canada's under-20 team. When he was named to the team in December 2003, he became the fifth 16-year-old to represent Canada at the tournament, following Jay Bouwmeester, Jason Spezza, Eric Lindros and Wayne Gretzky. Competing in the 2004 World Junior Championships in Helsinki, he then became the youngest player to score a goal in the history of the tournament at 16 years, 4 months, and 21 days when he scored against Switzerland in a 7–2 win. This record would last until the 2012 World Juniors, when Aleksander Barkov of Finland scored a goal aged 16 years, 4 months. 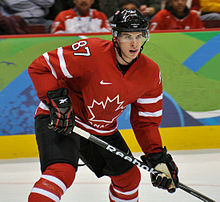 Crosby finished the tournament with two goals and three assists in six games, helping Canada to a silver medal finish. The following year, he returned for Canada at the 2005 World Junior Championships in Grand Forks, North Dakota. He improved to six goals and three assists as Canada earned gold. Crosby stated the following year that his most memorable hockey moment was winning his World Junior gold medal. After completing his rookie season with the Pittsburgh Penguins, Crosby competed in the 2006 IIHF World Championship as an alternate captain for Canada. Scoring a tournament-best eight goals and eight assists in nine games, he became the youngest player ever to win a World Championship scoring title. Despite his performance, Canada failed to medal, being shut-out by Finland 5–0 in the bronze medal game. Crosby was named the tournament's top forward and to the competition's all-star team. After omitted from Canada's Olympic team in 2006, Crosby was named to the Canadian roster on December 30, 2009, as an alternate captain for the 2010 Winter Olympics in Vancouver. He scored the game-winning shootout goal for Canada in the second game of the preliminary round against Switzerland. After going pointless in the quarter- and semi-final against Russia and Slovakia respectively, Crosby scored the winning goal 7 minutes and 40 seconds into overtime against the United States in the gold medal game. The goal has later become known as the "Golden Goal" due to it being scored in the gold medal game. It is also regarded by some as "Canada's most iconic sports moment". 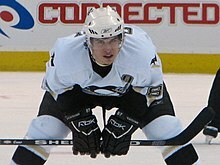 Following the Penguins' second-round elimination in the 2010 playoffs, Crosby declined an invitation to join Canada midway through the 2010 IIHF World Championship in Germany. Crosby was selected to represent Canada at the 2014 Winter Olympics and was later named team captain. Canada won gold, with Crosby contributing one goal and two assists in six games. He scored his only goal in the final against Sweden, further establishing his reputation as "a player who rises up in big games". In 2015, Crosby captained Canada to its first World Championship title since 2007, with the team winning all 10 games and scoring 66 goals. Crosby, scoring four goals and seven assists in nine games, became the 26th member of the Triple Gold Club. He is the first member of the club to captain all three championship teams, and the first member to be a first overall NHL draft pick. In 2016, Hockey Canada named Crosby captain for the 2016 World Cup of Hockey in Toronto. Crosby, who led the tournament in scoring with ten points, helped Team Canada win the championship, and was named the Most Valuable Player. He joined Bobby Orr and Wayne Gretzky as the only players to win the Conn Smythe, Hart Memorial Trophy and World Cup MVP. Team Canada head coach Mike Babcock described Crosby as a serial winner, saying, "He's that high-end competitor. He's a good leader because he tries to do it right all the time. He demands a lot out of himself. In doing so, he demands a lot out of his teammates." His lower-body strength is probably unparalleled in the league. It's not just about his speed, but how he can use his lower body to protect the puck in the corner. When he takes the puck through the neutral zone, he's a nightmare to defend because he seems to explode and take it to another gear as soon as the puck touches his stick. – Logan Couture of the San Jose Sharks on Crosby. As captain and first line centre for Canada, Crosby played with different line mates in almost every game as the coaching staff struggled to find players capable of keeping pace with the superstar centre at the 2010 Winter Olympic Games in Vancouver, and again at the 2014 Winter Olympic Games in Sochi. Crosby's fellow countryman and Olympic teammate, Rick Nash, was questioned by the media about this, at one point saying, "I think he's a tough guy to keep up with. He's so fast. The way he thinks about the game seems like it's far beyond everyone else's process. It's the same thing in the last Olympics, keep shuffling around until you found something that fit." Team Canada's assistant coach in Vancouver, Ken Hitchcock, recalled, "Sid thinks at a level, when the other team has the puck, that's above everyone else in the league [NHL]. His anticipation when the other team has the puck is so high, he knows where it's going ahead of time. He can pick off passes, make you make errors. And then he also knows where people are located on the ice, so he can turn that turnover into a scoring chance." Other professional NHL players have particularly noted Crosby for his backhand shot. For example, in his column for The Players' Tribune, Jonathan Quick of Los Angeles Kings praised Crosby for having "the best backhand shot" in the NHL. "His blade is almost completely flat, which combined with his ridiculous forearm strength gives him the ability to go forehand to your five hole instantly or turn it over to the backhand and roof it (a lot of guys can't do this with a flat blade)." Crosby during a game against the New York Islanders in 2018. Noted for his on-ice vision, passing ability, leadership, work ethic and complete overall game, Crosby is considered one of the greatest players of all time. Wayne Gretzky said of Crosby, "He's proven over and over that he's the best player in the game today. And it seems like the more important the game, the more impact that he makes on a game." Gordie Howe was also impressed by Crosby, "I met him and I've seen him play. Unless you put two guys on him, he'll kill you in a game." In 2016, Mario Lemieux praised his protégé for his ability to play both sides of the puck: "I think he's more of a complete player. Defensively, I think he's improved a lot over the last couple of years." 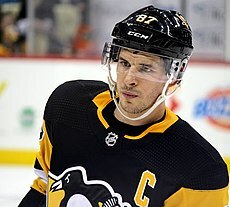 In an article for The Washington Post, other players, teammates and coaches highlighted his work ethic and strive for greatness as a major factor to Crosby's lasting success. "While his natural ability – powerful skating, pistol-quick hands, uncommon feel – made him a phenom, his creative, distinct capacity for work has enabled him to stay atop the NHL." Current Pittsburgh head coach Mike Sullivan described Crosby as "best 200-foot player in the game" and the "heartbeat" of the Penguins. On January 27, 2017, in a ceremony during the All-Star Weekend in Los Angeles, Crosby was named one of the 100 Greatest NHL Players in history. In that same year, Fox Sports ranked Crosby 15th on their "21 greatest athletes of the 21st century (so far)" list, and TSN named him the eighth-best NHL player of all-time. In a survey conducted by Sportsnet in June 2017, Crosby was voted by Canadians to be the greatest athlete of the 21st century. A poll conducted by the NHLPA in 2018 of more than 500 players resulted in Crosby being voted the "most difficult to play against, best role model, best team player, the player you'd want to win one game, and the player who would be a great coach upon retirement". In 2018, Crosby was chosen as Nova Scotia's "Best athlete ever" by the Nova Scotia Sport Hall of Fame. In 2019, an anonymous survey conducted by The Athletic showed that Crosby was regarded the best all-around NHL player by his peers. Considered a generational talent and a franchise player, drafting Crosby changed the fortunes of a struggling Pittsburgh Penguins. It helped secure funding for a new arena and ended speculation that the franchise would relocate to another city. In 2005–06, his presence helped Pittsburgh's attendance increase by 33%. Crosby's arrival also aided in reinvigorating and expanding the roots of hockey in the Pittsburgh area. Penguins CEO and president David Morehouse said, "We were in last place, we were last in revenues, we were last in attendance, our TV ratings were minimal and we were in the oldest building in the NHL... We were able to draw attention to us as a franchise because of the drafting of Sidney Crosby and the subsequent success we had." Crosby's number 87 Pittsburgh Penguins jersey was the top seller on the NHL's website from September 2005 to February 2008. It has continued to be among the top-selling jerseys since his rookie season. In January 2005, an Air Canada baggage handler in Montreal stole Crosby's red Canada jersey from the World Junior Hockey Championship. It was recovered later in a mailbox. His white jersey from the tournament was temporarily delisted from an auction while the red one was missing. It eventually sold for $22,100, which went to youth hockey charities and 2004 Indian Ocean earthquake relief. Less than a year later, one of Crosby's game-worn sweaters disappeared. The jersey he wore in his first NHL game, played against the New Jersey Devils, disappeared from his father's luggage during a flight from Pittsburgh to Buffalo. The jersey was later found at the Pittsburgh International Airport between a piece of equipment and a stairwell. Crosby's jersey from his third NHL game was the highest-selling NHL jersey in an auction for Hurricane Katrina relief – it sold for $21,010. During an online auction held by the NHL and the NHL Players Association to benefit Hockey Fights Cancer, Crosby's game-worn jersey from the first period of the 2007 All-Star Game earned the most money. Crosby's sold for $47,520, more than eight times the next highest price—$5,681 for the jersey worn by Brendan Shanahan of the New York Rangers. Following Crosby's Olympic gold medal victory with Canada in 2010, it was announced that his stick and glove were missing. It was initially suspected that they might have been stolen; Reebok Canada offered a reward of CAD$10,000 for their return, "no questions asked". On March 10, the items were found: Crosby's stick had been placed in a shipment bound for the International Ice Hockey Federation Hall of Fame in Saint Petersburg, Russia, (the shipment was intercepted in Toronto) and his glove was found in a hockey bag belonging to Olympic teammate and Boston Bruins' centre Patrice Bergeron, whose stall was beside Crosby's in the locker room. "Home of Sidney Crosby" city sign in Cole Harbour. Crosby rarely discusses his personal life and avoids social media. Andy O'Brien, Crosby's fitness trainer for over 15 years, has said: "He [Crosby] wants to be one of the guys and doesn't really seek to separate himself or get special treatment in any way... He takes a lot of enjoyment in the regular, simple things in life and having a normal, ordinary routine." Crosby lived with Mario Lemieux's family in Sewickley, Pennsylvania, from 2005 until 2010. In the spring of 2010, Crosby purchased his own home in the same area. In June 2006, he bought his first house on Grand Lake in Halifax, Nova Scotia. On May 29, 2010, it was announced that Crosby would sign the richest endorsement contract in NHL history with Reebok, expected to pay Crosby $1.4 million per year for five to seven years. In 2015, he signed a six-year endorsement contract with Adidas. Crosby also has endorsement deals with Bell, Tim Hortons and Gatorade. Regarded as one of Canada's "legendary goal-scorers and storied leaders", Crosby was featured in Canada Post's NHL Great Canadian Forwards stamp collection, alongside Phil Esposito, Guy Lafleur, Darryl Sittler, Mark Messier and Steve Yzerman. In 2016, he won an Emmy Award for his role in There's No Place Like Home With Sidney Crosby. Crosby has a younger sister, Taylor, who is a hockey goaltender. Like her brother, she went to high school at Shattuck-Saint Mary's in Faribault, Minnesota, to play with the school's hockey program. In 2014, Taylor joined the Northeastern Huskies women's ice hockey team as a freshman at Northeastern University in Boston. In 2015, she transferred to Minnesota’s St. Cloud State University and played with the St. Cloud State Huskies women's ice hockey team through to graduation at the end of the 2017–18 school year. Crosby continues to be active in the community in Cole Harbour, Nova Scotia. He created the Sidney Crosby Foundation in 2009, an organization committed to providing support to charities benefiting children. In 2015, he launched an inaugural Hockey School in Cole Harbour. His "Little Penguins Program" has provided free equipment and lessons to more than ten thousand local youngsters in Pittsburgh. 1999–2000 stats are from: "Age-old question: Cole Harbour hockey association bars peewee player from bantam tourney". The Halifax Daily News. April 5, 2000. Crosby holding the Stanley Cup following the 2017 Stanley Cup Finals. Crosby with an Olympic gold medal following the 2010 Winter Olympics. Youngest player to record 2 consecutive 100-point seasons (19 years, 215 days). 6th player in NHL history to win multiple Conn Smythe Trophies. ^ The NHL Central Scouting Bureau divide their rankings by position (goaltenders and skaters) and playing region (North American and Europe). Accordingly, Crosby was ranked as the best North American skater. ^ a b Podnieks, Andrew (2011). Sid vs. Ovi: Crosby and Ovechkin as Natural Born Rivals. McClelland & Stewart Ltd. ISBN 978-0-7710-7116-4. ^ "NHL Entry Draft Year by Year Results". National Hockey League. Archived from the original on August 13, 2013. ^ "Pens sign Crosby to $43.5 million extension". Associated Press. July 10, 2007. Archived from the original on October 2, 2007. Retrieved March 30, 2008. ^ Diana, Peter (October 1, 2006). "Time for Crosby to write Chapter 2". Pittsburgh Post-Gazette. Archived from the original on June 10, 2008. Retrieved May 28, 2008. ^ a b c "Sidney Crosby Signs Three-Year Deal with Frito Lay's and Pepsi". Wire Services. May 25, 2006. Archived from the original on November 7, 2006. Retrieved November 17, 2006. ^ a b c "Players: Sidney Crosby, Notes". Archived from the original on December 9, 2006. Retrieved December 10, 2006. ^ Allen, Kevin (December 15, 2009). "Legendary story of Crosby dryer has a little bit of a wrinkle". USA Today. Archived from the original on June 28, 2011. Retrieved March 13, 2011. ^ Kirkpatrick, Audrey (Spring 2008). "Look who's from D2: Sidney Crosby!" (PDF). Achieve. School District 2: 22. Archived from the original (PDF) on July 14, 2014. Retrieved July 12, 2014. ^ Burnside, Scott (August 2, 2005). "Crosby handles draft hoopla like veteran". ESPN. Archived from the original on November 4, 2012. Retrieved May 2, 2008. ^ Jones, Terry (January 17, 2007). "It takes a village to raise a phenom". Edmonton Sun. Archived from the original on July 19, 2012. Retrieved May 2, 2008. ^ La Rose, Jason. "When 'The Kid' Was A Kid: Revisiting Sidney Crosby's remarkable 2002 Air Canada Cup performance". Hockey Canada. Archived from the original on July 14, 2014. Retrieved July 12, 2014. ^ "Crosbys-visit-to-market-makes-fans-day". Archived from the original on February 5, 2013. Retrieved April 14, 2012. ^ Reyno, Jim. Bearcats scoop up 13-year-old Crosby: [DAILY Edition]. Daily News [Halifax, N.S. ], June 17, 2001, p. 77. ^ Fleming, Carl. Rotating Atlantic Bowl was predictable move: [DAILY Edition]. Daily News [Halifax, N.S. ], June 19, 2001, p. 47. ^ Van Horne, Ryan. Crosby adapting very well: [DAILY Edition]. Daily News [Halifax, N.S. ], September 10, 2001: p. 32. ^ a b c Price, S.L. (February 8, 2010). "Destiny's Child". Sports Illustrated. Archived from the original on February 7, 2010. Retrieved May 8, 2010. ^ "Crosby's true nickname ... Darryl?". ESPN. October 4, 2005. Archived from the original on March 3, 2006. Retrieved January 26, 2008. ^ "Crosby gets 3 points in QMJHL opener". The Canadian Press. September 19, 2004. Archived from the original on September 29, 2007. Retrieved November 17, 2006. ^ a b "Crosby headlines CHL All-Star team". The Canadian Press. May 21, 2004. Archived from the original on September 29, 2007. Retrieved November 17, 2006. ^ "Sidney Crosby". National Hockey League. Archived from the original on July 2, 2014. Retrieved July 12, 2014. ^ "Crosby rejects $7.5M offer from WHA". TSN. August 25, 2004. Archived from the original on September 29, 2007. Retrieved November 17, 2006. ^ "2005 Year in Review". Canadian Broadcasting Corporation. December 20, 2005. Archived from the original on December 27, 2008. Retrieved October 20, 2008. ^ "Crosby nets first point in loss to Devils". TSN. October 5, 2005. Archived from the original on March 12, 2007. Retrieved November 17, 2006. ^ "Mario Lemieux retires from hockey". Canadian Broadcasting Corporation. January 26, 2006. Archived from the original on October 12, 2007. Retrieved November 17, 2006. ^ "Crosby comes to Canada, Penguins face Leafs". CBC Sports. January 2, 2006. Archived from the original on November 7, 2012. Retrieved June 3, 2008. ^ a b c d Campigotto, Jess (September 27, 2006). "The education of Sidney Crosby". CBC Sports. Archived from the original on November 13, 2006. Retrieved November 17, 2006. ^ "Alex Ovechkin, Joe Thornton steal show". The Vancouver Sun. June 23, 2006. Archived from the original on June 21, 2009. Retrieved June 5, 2009. ^ "Decade of Crosby-Ovechkin filled with highlights". National Hockey League. October 28, 2015. Archived from the original on October 27, 2016. Retrieved October 26, 2016. ^ Basu, Arpon (March 22, 2006). "Don't forget, Sid's still a Kid". thefourthperiod.com. Archived from the original on December 30, 2006. Retrieved December 24, 2006. ^ "Crosby hat trick sparks Penguins rout". Associated Press. October 28, 2006. Archived from the original on October 12, 2007. Retrieved November 17, 2006. ^ "Crosby's six points leads Pens to win". Associated Press. December 13, 2006. Archived from the original on December 16, 2006. Retrieved December 13, 2006. ^ Johnston, Mike; Walter, Ryan (2007). Simply the Best: Players on Performance. Heritage House Publishing Co. ISBN 978-1894974240. Retrieved July 12, 2014. ^ "Sens spoil Crosby's playoff debut, take 1–0 lead". ESPN. Archived from the original on July 3, 2009. Retrieved June 5, 2009. ^ "Penguins to make Crosby youngest captain in NHL history". Associated Press. May 31, 2007. Archived from the original on October 12, 2007. Retrieved May 31, 2007. ^ "Penguins make Crosby captain; Now that he feels ready Sidney becomes the youngest captain in league history". The Record. Kitchener, ON. June 1, 2007. p. C3. ^ "Sidney Crosby completes rare triple in winning all the major NHL awards". The Canadian Press. June 15, 2007. Archived from the original on June 10, 2008. Retrieved March 26, 2008. ^ a b "The Players' Choice". ^ a b Canadian Press. "Crosby youngest to be named to all-star team". The Sports Network. Archived from the original on July 14, 2014. Retrieved July 12, 2014. ^ "Rise of the Two-Headed Monster". December 2, 2008. Retrieved May 12, 2017. ^ "Penguins sign Crosby to extension". The Canadian Press. July 10, 2007. Archived from the original on July 11, 2007. Retrieved July 10, 2007. ^ "Crosby gets Howe hat trick against Bruins". The Canadian Press. December 20, 2007. Archived from the original on December 24, 2007. Retrieved December 21, 2007. ^ "Crosby scores shootout winner as Penguins nip Sabres in Winter Classic". ESPN. January 2, 2008. Archived from the original on June 24, 2016. Retrieved June 17, 2016. ^ "Pens: Crosby to miss 6–8 weeks". TSN. January 22, 2008. Archived from the original on January 23, 2008. Retrieved January 22, 2008. ^ "Penguins blank Lightning in Sid's return". The Canadian Press. March 4, 2008. Archived from the original on March 5, 2008. Retrieved March 5, 2008. ^ "Crosby Back on Bench With an Injured Ankle". News Services. March 15, 2008. Archived from the original on November 4, 2012. Retrieved March 28, 2008. ^ "Ruutu's career-high 3 points lead Penguins over Islanders as Crosby returns to lineup". Associated Press. March 27, 2008. Archived from the original on March 30, 2008. Retrieved March 28, 2008. ^ "2007–2008 – Regular Season – Skater – Summary – Points". National Hockey League. Archived from the original on July 14, 2014. Retrieved July 12, 2014. ^ "Full voting results for the 2008 NHL Awards". The Hockey News. Archived from the original on July 11, 2014. Retrieved July 12, 2014. ^ "Stanley Cup Champions and Finalists". National Hockey League. Archived from the original on July 19, 2014. Retrieved July 12, 2014. ^ "Penguins hold off Red Wings with 3–2 win". Daily News. New York. May 28, 2009. Archived from the original on June 20, 2009. Retrieved June 5, 2009. ^ "Crosby scores 100th NHL goal, adds 200th assist". Yahoo! Sports. Associated Press. October 18, 2008. Archived from the original on October 23, 2008. Retrieved October 19, 2008. ^ "Crosby's injury status unclear". Canadian Broadcasting Corporation. October 31, 2008. Archived from the original on June 26, 2009. Retrieved June 5, 2009. ^ "Evgeni Malkin scores 50th goal, will win Art Ross Trophy". CBSSports. April 7, 2015. Retrieved July 17, 2015. ^ "Ovechkin's hat trick puts Pens in 2-game hole". CBC Sports. May 4, 2009. Archived from the original on May 8, 2009. Retrieved May 11, 2009. ^ "Crosby, Penguins overwhelm Capitals in end". National Post. Archived from the original on May 15, 2009. Retrieved June 5, 2009. ^ "Crosby and Pens celebrate East title with trophy". National Hockey League. Archived from the original on May 30, 2009. Retrieved June 5, 2009. ^ Burnside, Scott. "Cup win completes incredible journey". ESPN. Archived from the original on June 15, 2009. Retrieved June 13, 2009. ^ Morosi, Jon Paul. "Penguins' heart overcomes Crosby injury". Fox Sports. Archived from the original on June 16, 2009. Retrieved June 13, 2009. ^ "Loss, Crosby's snub leave Red Wings with bitter taste". The Sports Network. June 13, 2009. Archived from the original on June 4, 2011. Retrieved December 29, 2010. ^ Gorman, Kevin (June 15, 2009). "Retirement isn't in plans for Pens' Guerin". Pittsburgh Tribune-Review. Archived from the original on June 18, 2009. Retrieved December 29, 2010. ^ Stanley Cup birthday: Crosby brings trophy home Sidney Crosby brought quite the present to his hometown during a celebration of his 22nd birthday Archived February 23, 2015, at the Wayback Machine, oldseattletimes.com. Retrieved February 23, 2015. ^ "Crosby, Stamkos share Richard Trophy with 51 goals". National Hockey League. November 4, 2010. Archived from the original on April 14, 2010. Retrieved December 29, 2010. ^ "Henrik Sedin named Hart Trophy winner". National Hockey League. June 23, 2010. Archived from the original on July 6, 2015. Retrieved July 5, 2015. ^ "Bridgestone Messier Leadership Award". National Hockey League. Archived from the original on July 6, 2014. Retrieved July 12, 2014. ^ Canadian Press. "Mark Messier hands Sid the Kid the monthly NHL leadership award". The Hockey News. Archived from the original on July 14, 2014. Retrieved July 12, 2014. ^ "Sidney Crosby – Playoff Game Log (2009–2010)". National Hockey League. Archived from the original on July 14, 2014. Retrieved July 12, 2014. ^ "Lemieux and Crosby Christen CONSOL Energy Center Ice Surface". Pittsburgh Penguins. July 27, 2010. Archived from the original on July 22, 2015. Retrieved July 20, 2015. ^ "Crosby discusses lengthy recovery road from concussions, safety of the game". The Globe and Mail. September 5, 2013. Archived from the original on March 4, 2016. Retrieved April 24, 2016. ^ "Sidney Crosby's Point Streak Ends at 25 Games in Penguins Loss to Rick DiPietro, Islanders". New England Sports Network. December 30, 2010. Archived from the original on December 31, 2010. Retrieved February 13, 2011. ^ "Fans vote Crosby, Malkin, Toews, Letang, Keith and Fleury the first six All-Stars for the 2011 All-Star Game". National Hockey League. January 4, 2011. Archived from the original on January 7, 2011. Retrieved January 4, 2011. ^ "New Jersey Devils' Steckel still sorry for hit on Pens' Crosby". ESPN. March 4, 2011. Archived from the original on June 29, 2011. Retrieved April 12, 2011. ^ "2010–2011 Regular Season Stats". National Hockey League. Archived from the original on May 13, 2012. Retrieved April 12, 2011. ^ a b Lambert, Ryan (March 30, 2011). "What We Learned: No sympathy for NHL's playoff berth chokers". Yahoo!. Archived from the original on April 14, 2011. Retrieved April 12, 2011. ^ "Crosby returns to NHL with two goals, two assists". CTV.ca. November 21, 2011. Archived from the original on November 25, 2011. Retrieved November 21, 2011. ^ a b Gelston, Dan; Graves, Will (December 12, 2011). "Concussion-like symptoms force Crosby out again". The Globe and Mail. Wayback Machine. Associated Press. Archived from the original on January 11, 2012. Retrieved July 14, 2014. ^ Crechiolo, Michelle (March 15, 2012). "Endgame: Penguins 5, Rangers 2". Pittsburgh Penguins. Archived from the original on July 15, 2014. Retrieved March 16, 2012. ^ Rebuilding Sidney Crosby's brain. A little-known treatment by a Canadian-born chiropractor to the stars may be the key to his comeback Archived February 26, 2014, at the Wayback Machine, macleans.ca. Retrieved February 23, 2015. ^ Epstein, David (October 3, 2011). "Getting Inside The Head of Sidney Crosby". Sports Illustrated. Archived from the original on March 2, 2014. Retrieved February 23, 2014. ^ "NHL.com predicts 2012 Stanley Cup Playoffs". National Hockey League. Archived from the original on April 26, 2012. ^ "2012 Stanley Cup playoffs: Experts' picks". ESPN. Archived from the original on April 27, 2012. ^ "Crosby only hurting himself with his antics", National Post, April 17, 2012. Retrieved February 23, 2015. ^ Sidney Crosby profile Archived December 12, 2013, at the Wayback Machine, triblive.com. Retrieved February 23, 2015. ^ Sidney Crosby Post Game Interview Game 3 Pens @ Flyers. April 15, 2012. Archived from the original on May 20, 2015 – via YouTube. ^ "Sidney Crosby gets testy" Archived April 13, 2016, at the Wayback Machine, Yahoo!. Retrieved February 23, 2015. ^ "Sidney Crosby to sign 12-year, $104.4M extension". June 28, 2012. Archived from the original on June 30, 2012. Retrieved June 28, 2012. ^ The Canadian Press. "NHL Lockout Over as Memorandum of Understanding Signed". The Sports Network. Archived from the original on July 14, 2014. Retrieved July 12, 2014. ^ Molinari, Dave (December 18, 2012). "Crosby Delays Decisions". Pittsburgh Post-Gazette. Archived from the original on July 7, 2015. Retrieved July 12, 2014. ^ Mirtle, James (May 30, 2013). "The Inside Story of Crosby's Gruesome Facial Injury". The Globe and Mail. Archived from the original on May 6, 2015. Retrieved July 12, 2014. ^ "2012–2013 – Regular Season – Skater – Summary – Points". National Hockey League. Archived from the original on July 14, 2014. Retrieved July 12, 2014. ^ Graves, Will. "Sidney Crosby's return can't save Pittsburgh Penguins from pesky New York Islanders". National Post (May 3, 2014). Archived from the original on July 15, 2014. Retrieved July 12, 2014. ^ Kreda, Allan (May 11, 2013). "Islanders Put on a Show, but Then the Penguins Drop the Curtain". The New York Times. Archived from the original on August 2, 2013. Retrieved July 12, 2014. ^ Garrioch, Bruce (June 7, 2013). "Penguins, built to win Stanley Cup, wimper out of playoffs". Toronto Sun. Retrieved July 12, 2014. ^ "2012–13 NHL Awards Recap". nhlpa.com. Archived from the original on July 6, 2015. Retrieved July 5, 2015. ^ "Sidney Crosby of Pittsburgh Penguins named NHL MVP for 2nd time". ESPN. Archived from the original on June 25, 2014. ^ "NHL Awards: Sidney Crosby wins Hart Trophy, Ted Lindsay Award". Associated Press. Archived from the original on July 24, 2015. Retrieved May 18, 2015. ^ "Penguins fire Ray Shero, new GM to decide Dan Bylsma's fate". CBS Sports. May 16, 2014. Archived from the original on May 17, 2014. Retrieved May 16, 2014. ^ NHL Public Relations (June 24, 2015). "Stars' Jamie Benn wins Art Ross Trophy". National Hockey League. Archived from the original on June 27, 2015. Retrieved July 19, 2015. ^ Wes Crosby (January 4, 2015). "Penguins' Crosby scores 300th NHL goal". National Hockey League. Archived from the original on July 9, 2015. Retrieved July 20, 2015. ^ "Penguins add to staff after injury-plagued season". National Hockey League. July 14, 2015. Archived from the original on July 17, 2015. Retrieved July 19, 2015. ^ Dan Rosen (April 19, 2015). "Crosby helps Penguins even series with Rangers". National Hockey League. Archived from the original on July 10, 2015. Retrieved July 19, 2015. ^ Dan Rosen (April 25, 2015). "Hagelin, Rangers edge Penguins in OT, win series". National Hockey League. Archived from the original on July 16, 2015. Retrieved July 19, 2015. ^ "Mike Sullivan Named Head Coach of Pittsburgh Penguins". December 12, 2015. Archived from the original on December 15, 2015. Retrieved December 12, 2015. ^ "How much was Sidney Crosby hurt by coach Mike Johnston?". January 8, 2016. Archived from the original on January 14, 2016. Retrieved February 7, 2016. ^ "If Sidney Crosby isn't the NHL's No. 1 player, who is?". December 16, 2015. Archived from the original on December 29, 2015. Retrieved February 7, 2016. ^ "Sidney Crosby left off roster for NHL All-Star Game". January 6, 2016. Archived from the original on June 25, 2016. Retrieved June 4, 2016. ^ "Sidney Crosby reclaims place among greats after slow start". March 31, 2016. Archived from the original on April 3, 2016. Retrieved April 1, 2016. ^ "Sidney Crosby hat trick lifts Penguins over Senators". February 2, 2016. Archived from the original on February 4, 2016. Retrieved February 7, 2016. ^ "Sidney Crosby surpasses 900-point mark in comeback win". February 6, 2016. Archived from the original on February 7, 2016. Retrieved February 7, 2016. ^ "Sidney Crosby Named NHL First Star for March". April 1, 2016. Archived from the original on May 13, 2016. Retrieved April 2, 2016. ^ "Penguins overcame a lot to make playoffs". April 2, 2016. Archived from the original on April 19, 2016. Retrieved April 3, 2016. ^ "Sidney Crosby Named Penguins' Team MVP". April 4, 2016. Archived from the original on April 23, 2016. Retrieved April 5, 2016. ^ "Bowman: Crosby Would Be Good Selke Candidate". April 4, 2016. Archived from the original on May 7, 2016. Retrieved April 9, 2016. ^ "Bowman: Gretzky excited for Ovechkin vs. Crosby". April 28, 2016. Archived from the original on June 5, 2016. Retrieved April 30, 2016. ^ "Sidney Crosby Named a Finalist for the Hart Memorial Trophy". May 7, 2016. Archived from the original on May 10, 2016. Retrieved May 7, 2016. ^ "Blackhawks, Kings, Capitals have big night at Awards". June 23, 2016. Archived from the original on June 23, 2016. Retrieved June 23, 2016. ^ "Penguins Eliminate Nemesis Rangers in Game 5 Rout". April 23, 2016. Archived from the original on April 27, 2016. Retrieved April 24, 2016. ^ "Ovechkin, Capitals again fail to reach East Final". May 11, 2016. Archived from the original on May 12, 2016. Retrieved May 17, 2016. ^ "Crosby lifts Penguins to OT win in Game 2". May 17, 2016. Archived from the original on June 16, 2016. Retrieved May 17, 2016. ^ "Sidney Crosby scores 1st playoff OT winner of his career". May 17, 2016. Archived from the original on May 19, 2016. Retrieved May 17, 2016. ^ "Stars Beginning to Align; Pens Finding Their Stride". May 19, 2016. Archived from the original on May 20, 2016. Retrieved May 19, 2016. ^ "Penguins win Game 6, extend series". May 25, 2016. Archived from the original on June 24, 2016. Retrieved May 25, 2016. ^ "Penguins defeat Lightning, Stamkos in Game 7". May 27, 2016. Archived from the original on June 30, 2016. Retrieved May 27, 2016. ^ Rosen, Dan (June 12, 2016). "Second Stanley Cup lifts Crosby's legacy". National Hockey League. Archived from the original on August 13, 2016. Retrieved June 12, 2016. ^ Rosen, Dan (June 12, 2016). "Crosby wins Conn Smythe Trophy". National Hockey League. Archived from the original on August 13, 2016. Retrieved June 13, 2016. ^ "Sidney Crosby diagnosed with concussion". October 10, 2016. Archived from the original on October 21, 2016. Retrieved October 20, 2016. ^ "Penguins' Sidney Crosby becomes 11th youngest to reach 1,000 points". February 16, 2017. Archived from the original on February 17, 2017. Retrieved February 17, 2017. ^ "Sidney Crosby Stands Out as the New All-Stars Gather". January 28, 2017. Archived from the original on January 31, 2017. Retrieved February 17, 2017. ^ "Crosby Finishes as the NHL's Leading Goal Scorer". April 10, 2017. Archived from the original on April 10, 2017. Retrieved April 10, 2017. ^ "McDavid wins Art Ross; Crosby wins Rocket Richard Trophy". April 10, 2017. Archived from the original on April 10, 2017. Retrieved April 10, 2017. ^ "Sidney Crosby Named a Finalist for the Ted Lindsay Award". May 2, 2017. Retrieved May 3, 2017. ^ "Penguins eliminate Blue Jackets with 5-2 win in Game 5". April 20, 2017. Archived from the original on April 22, 2017. Retrieved May 3, 2017. ^ "Penguins' Sidney Crosby out for Game 4 with concussion". May 2, 2017. Archived from the original on May 3, 2017. Retrieved May 3, 2017. ^ "Paul Coffey: NHL must look at Ovechkin's 'brutal' stick on Crosby". May 2, 2017. Retrieved May 3, 2017. ^ "Penguins again shatter Capitals' Cup dream, Senators up next". May 11, 2017. Archived from the original on May 11, 2017. Retrieved May 11, 2017. ^ "Penguins beat Senators in 2OT of Game 7 to return to Stanley Cup Final". May 25, 2017. Archived from the original on May 26, 2017. Retrieved May 26, 2017. ^ "The Stanley Cup Final starts anew with a pivotal Game 5". June 8, 2017. Retrieved June 10, 2017. ^ "Penguins one win from second straight Stanley Cup after thrashing Predators". June 9, 2017. Archived from the original on June 9, 2017. Retrieved June 10, 2017. ^ "Penguins repeat Stanley Cup with Game 6 win against Predators". June 12, 2017. Retrieved June 12, 2017. ^ "Penguins notebook: Sidney Crosby, 3 others log 82-game seasons". April 6, 2018. Retrieved April 9, 2018. ^ "Crosby scores 400th NHL goal for Penguins". National Hockey League. April 9, 2018. Retrieved February 13, 2018. ^ "Crosby gets 700th NHL assist in Penguins win". National Hockey League. March 21, 2018. Retrieved April 9, 2018. ^ Crosby, Wes (April 11, 2018). "Crosby has hat trick for Penguins in Game 1 win against Flyers". National Hockey League. Retrieved April 14, 2018. ^ a b Johnston, Mike (April 18, 2018). "Crosby passes Lemieux on Penguins' all-time playoff points list". sportsnet.ca. Retrieved April 19, 2018. ^ Kimelman, Adam (April 22, 2018). "Penguins eliminate Flyers in Game 6 behind four goals from Guentzel". National Hockey League. Retrieved April 22, 2018. ^ Madden, Mark (April 24, 2018). "Trottier sees similarities between current Penguins and 1982 Islanders". National Hockey League. Retrieved April 25, 2018. ^ Myers, Tracy (May 8, 2018). "Penguins' bid for three-peat ends against Capitals". National Hockey League. Retrieved May 8, 2018. ^ "Pens Captain Sidney Crosby Chosen to Play in the 2019 NHL All-Star Game". National Hockey League. January 3, 2019. Retrieved January 6, 2019. ^ "Sidney Crosby finally wins NHL All-Star MVP". Yahoo Sports. January 27, 2019. Retrieved January 27, 2019. ^ "Crosby has created own legacy with Penguins". National Hockey League. February 10, 2019. Retrieved February 10, 2019. ^ "Crosby's 4-point night steers Penguins clear of Canadiens in rout". cbc.ca. March 3, 2019. Retrieved March 3, 2019. ^ "Guentzel's OT winner lifts Penguins over Panthers". sportsnet.ca. March 5, 2019. Retrieved March 5, 2019. ^ "Penguins lock up playoff berth with 4-1 win over Red Wings". usatoday.com. April 4, 2019. Retrieved April 5, 2019. ^ "Penguins' Sidney Crosby: Sixth player to score 100 this year". cbssports.com. April 7, 2019. Retrieved April 7, 2019. ^ "Sidney Crosby". Elite Prospects. Archived from the original on August 10, 2014. Retrieved July 12, 2014. ^ "World Junior Hockey Championship – History (2004 – Helsinki)". The Sports Network. Archived from the original on October 23, 2013. Retrieved July 12, 2014. ^ Morreale, Mike G. "Barkov looks to shine for Finland at World Juniors". National Hockey League. Archived from the original on July 14, 2014. Retrieved July 12, 2014. ^ a b c Sager, Joe (May 23, 2006). "Crosby continued to re-write history at world championships". Archived from the original on April 23, 2007. Retrieved November 17, 2006. ^ LeBrun, Pierre (December 30, 2009). "Breaking down 2010 Canadian team". ESPN. Archived from the original on July 21, 2015. Retrieved July 17, 2015. ^ "Canada defeats U.S. for hockey gold". CBC Sports. cbcsports.ca. February 28, 2010. Archived from the original on March 3, 2010. Retrieved February 28, 2010. ^ Sidney Crosby profile Archived March 7, 2013, at the Wayback Machine, news.sportsinteraction.com. Retrieved May 14, 2014. ^ "Why Sidney Crosby's golden goal is Canada's most iconic sports moment". Sportsnet. Retrieved June 29, 2017. ^ "Crosby turns down offer to play for Canada at Worlds". The Sports Network. May 14, 2010. Archived from the original on May 17, 2010. Retrieved May 14, 2010. ^ Stevenson, Chris (January 19, 2014). "Sidney Crosby named captain for Canadian Olympic Team". SLAM Sports. Archived from the original on January 19, 2014. Retrieved January 19, 2014. ^ Allen, Kevin (February 23, 2014). "Sidney Crosby leads Canada past Sweden for golden repeat". USA Today. Archived from the original on June 22, 2015. Retrieved March 11, 2016. ^ "Hockey Canada Statistics". Archived from the original on May 14, 2014. Retrieved June 25, 2014. ^ Langr, Michael (May 17, 2015). "Crosby in Triple Gold Club with World Championship". National Hockey League. Archived from the original on May 18, 2015. Retrieved May 18, 2015. ^ "Sidney Crosby named Team Canada captain for World Cup". National Hockey League. August 25, 2016. Archived from the original on October 2, 2016. Retrieved September 29, 2016. ^ "Canada Stuns Europe in Final Minutes to Sweep World Cup". Retrieved October 1, 2016. ^ "Sidney Crosby and the soul of winning everything". Archived from the original on November 5, 2016. Retrieved May 23, 2017. ^ a b Elite Centers 101 Archived December 30, 2015, at the Wayback Machine, theplayerstribune.com. Retrieved December 29, 2015. ^ Sidney Crosby profile Archived February 27, 2014, at the Wayback Machine, canada.com. Retrieved May 14, 2014. ^ "Oilers' Connor McDavid still has improvements to make defensively". sportsnet.ca. February 14, 2019. Retrieved March 15, 2019. ^ a b Elite Snipers 101 Archived December 1, 2015, at the Wayback Machine, theplayerstribune.com. Retrieved December 29, 2015. ^ "Marshall: Sidney Crosby's puck distribution continues to evolve". theathletic.com. March 14, 2019. Retrieved March 16, 2019. ^ "Olympics changed Hitchcock's view on Crosby". November 23, 2011. Retrieved March 5, 2019. ^ a b "Sidney Crosby is still king of the NHL". Los Angeles Times. Archived from the original on November 4, 2016. Retrieved November 3, 2016. Ducks right wing Corey Perry, Crosby's World Cup and Olympic teammate, has seen Crosby's work ethic up close and marvels at it. "He's a heck of a hockey player and he puts in a lot of work, a lot of time, and he takes care of himself," Perry said. ^ "Sidney Crosby is still NHL's best player, but who is next in line?". CBS. Archived from the original on October 10, 2016. Retrieved October 5, 2016. ^ "Sidney Crosby in class by himself at World Cup of Hockey". Sportsnet. Archived from the original on October 5, 2016. Retrieved October 5, 2016. ^ "Second Stanley Cup title lifts Crosby's legacy". National Hockey League. Archived from the original on September 15, 2016. Retrieved October 5, 2016. ^ "Wayne Gretzky: Sidney Crosby is 'the best player in the game'". ESPN. Archived from the original on October 6, 2016. Retrieved October 5, 2016. ^ "Gordie Howe reveals what career advice he gave to Sidney Crosby". National Hockey League. Archived from the original on October 28, 2016. Retrieved October 27, 2016. ^ "Pittsburgh Penguins owner Mario Lemieux proud to see Sidney Crosby mature on and off ice". Metro. Archived from the original on October 5, 2016. Retrieved October 5, 2016. ^ "The subtle secret to Sidney Crosby's greatness". April 30, 2018. Retrieved May 2, 2018. ^ "More Praise for Sidney Crosby, 'He's the Heartbeat'". pittsburghhockeynow.com. March 15, 2019. Retrieved March 16, 2019. ^ Beacham, Greg (January 27, 2017). "NHL 100: Crosby, Ovechkin, Jagr join Gretzky and Co. on list of legends". CBC Sports. Archived from the original on January 31, 2017. Retrieved January 31, 2017. ^ "The 21 greatest athletes of the 21st century (so far)". Fox Sports. Archived from the original on April 2, 2017. Retrieved April 1, 2017. ^ Dryden, Steve (December 25, 2017). "The Greatest One". The Sports Network. Retrieved December 12, 2018. ^ "Infographic: Canadians say Crosby is best 21st-century athlete". Sportsnet. Retrieved June 29, 2017. ^ "Sidney Crosby gets ultimate respect in survey of NHL players". March 8, 2018. Retrieved March 8, 2018. ^ "No. 87 is No. 1: Sidney Crosby chosen as Nova Scotia's best athlete ever". April 30, 2018. Retrieved May 3, 2018. ^ "Pittsburgh Penguins Captain Sidney Crosby Named Best All-Around NHL Player By His Peers". March 1, 2019. Retrieved March 2, 2019. ^ "Crosby cements legacy with consecutive Stanley Cup wins". Reuters. June 12, 2017. Retrieved April 12, 2018. ^ "With his second straight Stanley Cup and Conn Smythe, Sidney Crosby is among the best ever". ESPN. June 12, 2017. Retrieved April 12, 2018. ^ "10 years ago tomorrow the Pittsburgh Penguins literally hit the lottery". Retrieved May 9, 2018. ^ "Hockey's biggest star returns with dramatic results, on and off the ice". Retrieved May 13, 2018. ^ Gulitti, Tom (February 24, 2017). "Sidney Crosby's legacy in Pittsburgh goes beyond Cup". National Hockey League. Retrieved May 9, 2018. ^ Reed, Tom (May 23, 2008). "Sidney Crosby: Aged to perfection". The Columbus Dispatch. Archived from the original on July 11, 2012. Retrieved May 23, 2008. ^ "US Airways finds sweater Crosby wore in first game". ESPN. October 11, 2006. Archived from the original on March 24, 2007. Retrieved December 24, 2006. ^ "Crosby jersey nets $22,100 at auction". CBC Sports. January 20, 2005. Archived from the original on October 12, 2007. Retrieved December 24, 2006. ^ Molarni, Dave (October 12, 2005). "Crosby's jersey found in stairwell at airport". Pittsburgh Post-Gazette. Archived from the original on June 18, 2006. Retrieved December 24, 2006. ^ "Crosby's first all-star jersey goes for $47,520". Associated Press. April 23, 2007. Archived from the original on May 7, 2007. Retrieved April 24, 2007. ^ "Reebok puts up bucks for Crosby's missing gear". CTV.ca. March 6, 2010. Retrieved March 7, 2010. ^ "Crosby's golden gear found, misplaced not stolen". CTV.ca. Archived from the original on March 12, 2010. Retrieved March 10, 2010. ^ Jason Mackey. "Crosby's off-ice life hardly reflects that of a superstar". triblive.com. Retrieved November 10, 2018. ^ Anderson, Shelly; Molinari, Dave (May 13, 2010). "Penguins Notebook: Crosby buys house not far from Lemieux's". Pittsburgh Post-Gazette. Archived from the original on May 16, 2010. Retrieved July 13, 2010. ^ Michelle Wright. "1-On-1 With Sidney Crosby". thepittsburghchannel.com. Archived from the original on September 20, 2007. Retrieved September 5, 2007. ^ "Penguins superstar Crosby signs multi-year deal with Adidas". Fox Sports. October 7, 2015. Archived from the original on November 4, 2016. Retrieved November 3, 2016. ^ Campbell, Ken (May 29, 2010). "Source: Sidney Crosby to sign richest endorsement deal in NHL history". The Hockey News. Archived from the original on March 13, 2012. Retrieved May 29, 2010. ^ "NHL Great Canadian Forward stamps celebrate hockey's legendary goal-scorers and storied leaders". Canada Post. September 23, 2016. Archived from the original on October 5, 2016. Retrieved October 4, 2016. ^ "Penguins' Crosby wins Emmy". Tribe Live. September 24, 2016. Archived from the original on October 1, 2016. Retrieved October 1, 2016. ^ a b Sporer, Evan (October 14, 2014). "The other Crosby". SB Nation. Retrieved April 12, 2018. ^ a b Berkman, Seth (November 27, 2017). "Hockey's Other Crosby Toils Outside the Spotlight". The New York Times. Retrieved January 11, 2018. ^ "Crosby's a poster boy for more than just hockey". Pros Give Back. September 14, 2011. Archived from the original on June 1, 2016. Retrieved May 1, 2016. 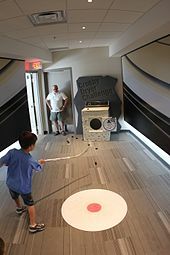 ^ "Sidney Crosby hockey school launching in Cole Harbour". The Chronicle Herald. July 30, 2015. Archived from the original on April 15, 2016. Retrieved May 1, 2016. ^ "Registration Begins Nov. 6 For Sidney Crosby's Little Penguins Program". National Hockey League. October 25, 2018. Retrieved October 26, 2018. ^ "Diamond Jubilee Medal Presentation to Sidney Crosby". gg.ca. September 4, 2008. Retrieved September 4, 2008. ^ "Sidney Crosby among 6 awarded Order of Nova Scotia". Canadian Broadcasting Corporation. September 4, 2008. Archived from the original on December 27, 2008. Retrieved September 4, 2008. ^ "Crosby beats out Kucera, Nash for Lou Marsh Award". The Sports Network. The Canadian Press. December 15, 2009. Archived from the original on December 18, 2009. Retrieved December 15, 2009. ^ "Sid the Kid named NHL player of the year; Crosby voted best by peers, Lacavalier second". Edmonton Journal. May 23, 2007. p. C3. ^ "Sidney Crosby Ranked No. 1 in Sporting News' 50 Greatest Players in Today's NHL". Sporting News. July 7, 2009. Archived from the original on July 13, 2015. Retrieved July 12, 2015. ^ "Crosby No. 1 for sixth straight year on TSN's Top 50 list". The Sports Network. September 30, 2015. Archived from the original on November 3, 2015. Retrieved November 13, 2015. ^ "10 on Ice". ESPN. December 26, 2009. Archived from the original on July 13, 2015. Retrieved July 12, 2015. ^ "Top 20 Athletes 1995–2015". ESPN. January 4, 2015. Archived from the original on July 23, 2015. Retrieved July 12, 2015. ^ "Crosby hits 100 points in Penguins win". The Canadian Press. April 18, 2006. Archived from the original on May 30, 2008. Retrieved June 27, 2008. ^ Gulitti, Tom (April 30, 2017). "Sidney Crosby leads by example, climbing Penguins record book". National Hockey League. Retrieved April 30, 2017. ^ Vest, David (January 27, 2007). "Crosby on verge of taking over Great One's throne". The Arizona Republic. Archived from the original on July 31, 2012. Retrieved June 27, 2008. ^ "CROSBY YOUNGEST TO SCORE 100; BREAKS LEMIEUX'S ROOKIE RECORD". National Hockey League. April 8, 2006. Retrieved December 31, 2017. ^ "Crosby youngest to net 200 NHL points". CBC Sports. March 2, 2007. Archived from the original on February 22, 2011. Retrieved April 29, 2008. ^ "Crosby becomes youngest player voted to start in All-Star Game". Tribune Review. Associated Press. January 10, 2007. Archived from the original on January 12, 2007. Retrieved January 11, 2007.